นั่ง search หาข้อมูลเกี่ยวกับ Hydroquinone จนมาเจอของดี(....หรือเปล่า ?) แต่ราคาถูกจริงแท้แน่นอนสำหรับ ไฮโดรควิโนน 2% ในราคาประมาณ 300 บาท ในปริมาณ 8.5 fl oz (250 ml) บอกไว้ก่อนเลยว่า ดีมาก!!!!!! Inactive Ingredients: Water, glycerin, mineral oil, isopropyl myristate, cetearyl alcohol, ceteareth-20, dimethicone, glyceryl stearate, PEG-100 stearate, lauryl polyglucose, xanthan gum, propylene glycol, vaccinium myrtillus extract, saccharum officinarum (sugar cane) extract, acer saccharinum (sugar maple extract, orange (citrus aurantium dulcis) fruit extract, citrus medica limonum (lemon) fruit extract, sodium sulfite, citric acid, tocopheryl acetate, ascorbyl palmitate, fragrance, diazolidinyl urea, sodium metabisulfate, methylparaben, disodium EDTA, propylparaben, zea mays (corn) oil, glyceryl oleate, BHA, BHT, TBHQ, lyral, citronellol, methyl ionone. Lightens dark discolorations in the skin such as: pigments in the skin that may occur in pregnancy or from use of oral contraceptives. 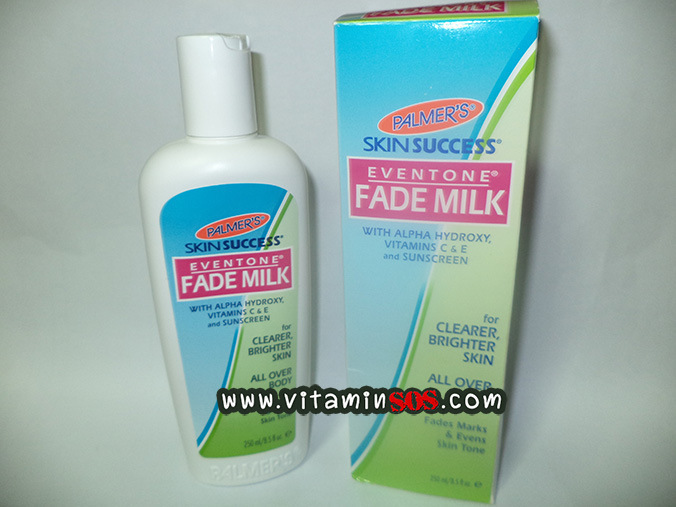 Palmer's Skin Success Eventone Fade Milk helps fade dark spots and evens skin tone all over body. Formulated with proven ingredients to lighten hyperpigmented areas which may be caused by scars, acne, sun exposure, severe dryness or pregnancy. Especially effective on problem areas such as knees and elbows. Luxurious moisturizers smooth and soften skin's texture while eliminating ashiness. With consistent use your own skin will be clearer, brighter and glow with a newfound radiance. An added sunscreen helps to maintain your skin and prevent darkening from recurring. Adults: Apply a small amount as a thin layer on the affected area twice daily, or use as directed by a doctor. If no improvement is seen after 3 months of treatment, use of this product should be discontinued. Lightened effect of this product may not be noticed on very dark skin.